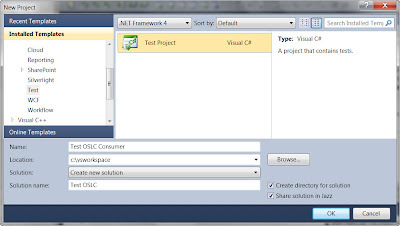 I have had some recent customer experiences which have impelled me to write some blogs on the RTC Visual Studio integration. This topic follows the previous series well, where I wrote about RTC and CDT. In fact, I will will basically recreate the OSLC example ( this time using C# ) but using the Visual Studio 2010 development environment instead. 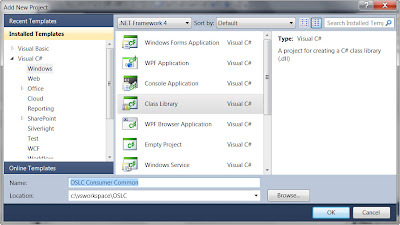 Meaning that I will be using visual studio not only for developing but writing unit tests and doing a static analysis all while using the RTC visual studio integration. 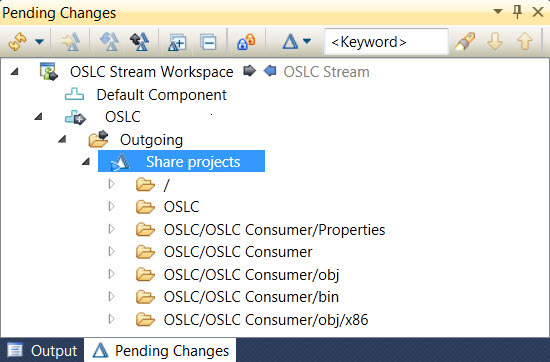 If you recall in the previous blog series on OSLC, I created an OSLC client in C/C++ using CDT. 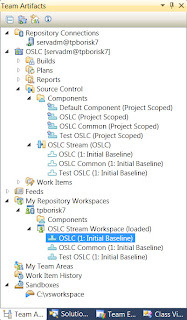 I could do the same in Visual Studio (OSLC client using C/C++, that is) but I will instead use C# to create the OSLC client this time to show how this can also be done. This exercise may work with other versions of Visual Studio as the integration supports other versions as well but I will use Visual Studio 2010 . 1. 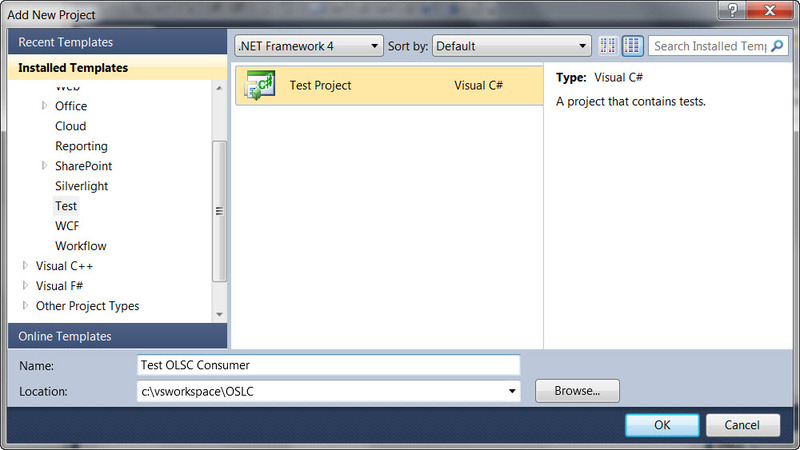 If you have installed your visual studio environment correctly, you can launch Visual Studio now. The Visual Studio RTC integration behaves very much like the Eclipse RTC integration. There are some key differences. 3. Create a new project area called OSLC and use the scrum template. Be sure to assign the user (in my case servadm) you will be connecting from Visual Studio as the “Scrum Master”. 6. Click next and select the OSLC project area we created and click "Finish". We are now connected. 9. Call the project OSLC Consumer and use a solution called OSLC (as we will created more projects in the future) in a preferred location. 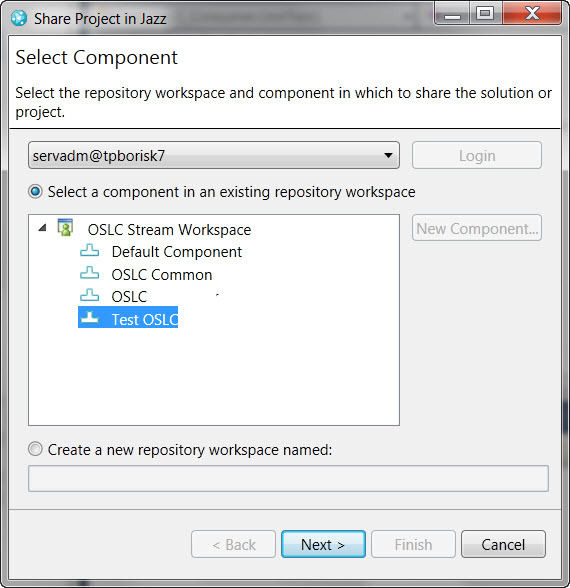 Make sure to select the "Share solution in Jazz" option. In anticipation of unit test we will eventually create lets create two more project skeletons. 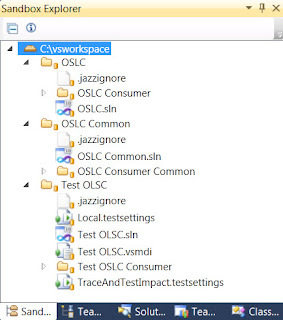 One called "OSLC Consumer Common"(containing common code) and a unit test project, "Test OSLC Consumer". Right click on the project and Add a project of type "Class Library"
16. 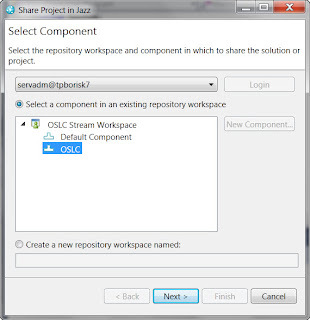 Unlike the solution there is not default option to add a project to Jazz Source control so we will have to do it now. Select both the new projects and right click and select the “Share Project(s) in Jazz...” option but do not click Finish! Notice a key difference here between the RTC eclipse and Visual studio integration. The Component alignment is done at the solution level rather then at the project level! 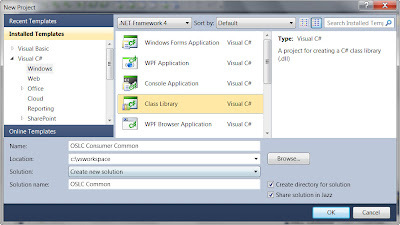 So in eclipse many projects are associated to a component, where in visual studio, many solutions to a component, where projects in the solution belong to the component of a solution. In effect, if we wanted to have the unit tests, common code and consumer client in different components you would essentially need to create three solutions (one for each) in the sandbox. As this is exactly what we want this is what we will do (but you don't have to). As I have gone through this detour to highlight this difference, lets revert and cancel out of the “Share Projects(s) in Jazz...”.. 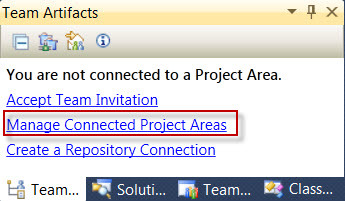 Right click on the two projects and select Right Click->remove. Also delete the corresponding directories on the file system. 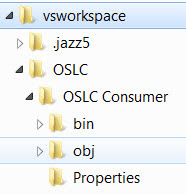 You will probably also want to delete the following files out of the solution directory: Local.testsettings, OSLC.vsmdi and TraceAndTestImpact,testsettings. 17. In anticipation of unit test we will eventually create lets create two more solution skeletons. 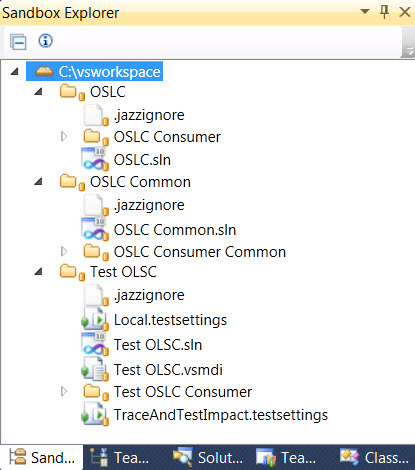 One called "OSLC Common" with a project called "OSLC Consumer Common" (containing common code) and one called "Test OSLC" with a unit test project, "Test OSLC Consumer". As we want these in separate components lets create two solutions for these projects. We will create these solutions in the same sandbox as the "OSLC" Solution above. 20. 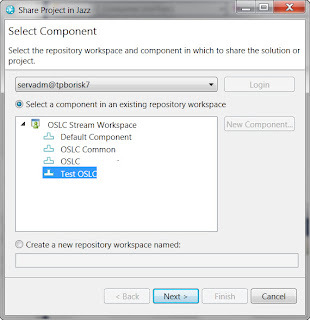 Delver the new solution and project to the OSLC Stream. 25. As i have named solutions the same as the Components we can easily see the projects in each component. 27. 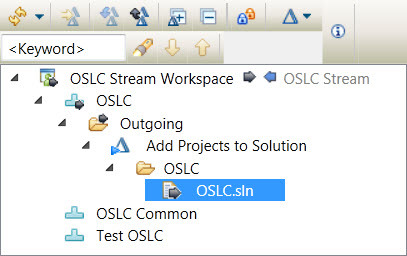 You can now deliver the OSLC.sln file to keep the changes to the solution. In the future we only need to open the OSLC solution. 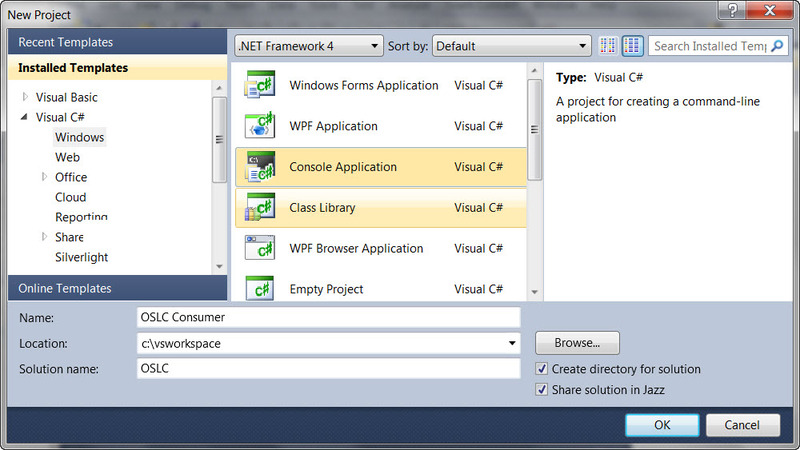 When you switch sandboxes Visual Studio will automatically ask you for a solution file. 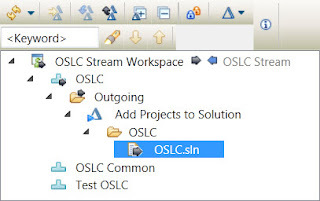 We will pick OSLC.sln from now on. This should prepare us for the next blog entry where we will start coding the OSLC client in C#. Thanks for the thoughtful example. I tried to check the returned XML document, it inform the XML have the wrong syntax. If you could provide me any hints to overcome this, it would be great! Did you look at the XML using a browser? Does it look ok? Make sure its ok in the browser, perhaps it returned using a different content type such as JSON. Yes, it is XML, I did check the syntax of the returned XML using a browser, and there are just few syntax errors, if I manually change it, the syntax will be OK. I can get a return XML with the correct syntax, however when I call the children links with GET methods for REST web services using your code, an exception will be raised. 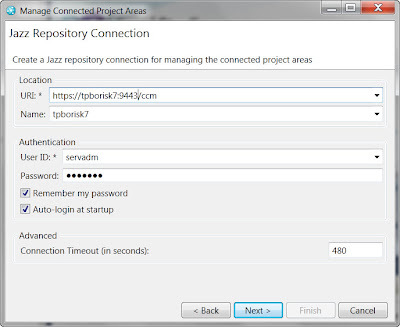 My assumption is that the Jazz team server is still in Beta, and not finish implementation yet, so we will need to wait? is that right? Also I could not find the details document of the web services API we can call for the apps such as DOORS NG on Jazz server! If you could share me some info in regarding to these issues, it would be great! Thank you so much for looking into this. Do you have any ideas how rm (requirement management) is diffrence with CCM? However, on next access call to get the Project areas, it will throw an exception -unauthorised access...because it is the secured page. It seems that CCM is using form based form-based authentication to access to the Service Providers, while RM is using OAuth authentication mechanism to access the Service Providers, so the code does not work with RM. The quesiton is, how CCM and RM can be difference in authentication, while they have lots of similarities in Jazz server. If you could help to get the code work for RM, it would be great! Ah, I see what you mean. Ok, yes, you will have to authenticate with JTS as well. I modified the authentication routine. I plan to write a more comprehensive OSLC example where i will include something like this. I also found a strange bug in my installation. Not sure if you get this as well. You will need to change the passed in serverURI as well to be without context as now it is searched for. and the code run fine for me. If you can give a complete example with code changes that works for both RM and CCM, it will be great. An interesting adding function such as getting requirements from a project would also be nice. I'm in charge of validating RTC through a Proof of Concept, but I'm unfortunately starting to discover the RTC subject. We want to validate that RTC could cover the sames Lifecycle areas than Microsoft Team Foundation Server. 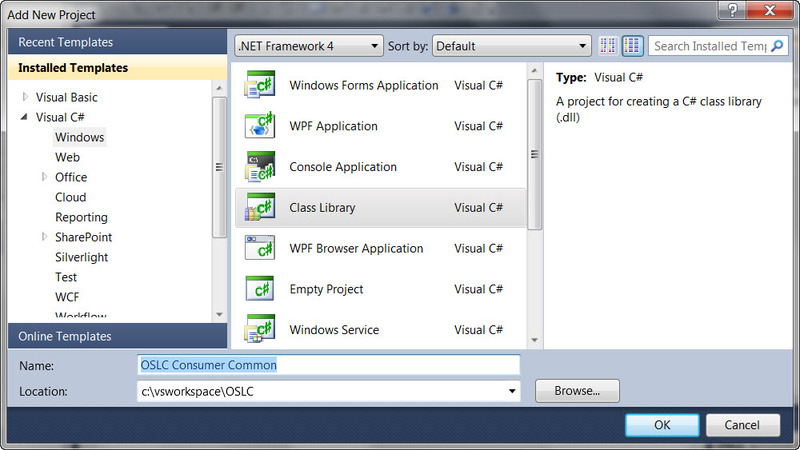 We took a long time to setup correctly the server, then to reach RTC from Visual Studio 2010! Now, I face problems in reaching the source code loaded in RTC from a basic user account. Note: it's ok using my admin account. I think something is not correctly setup within the Step 2 of your above tutorial session (part I). 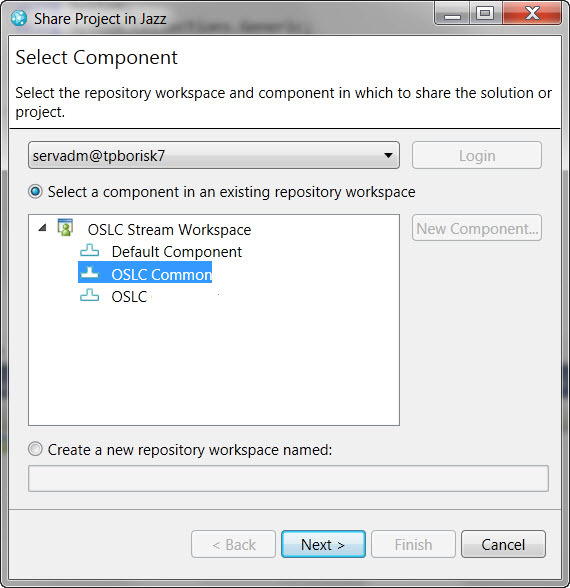 Could you help me in finding an userfriendly tutorial about configuring a Project Area (and Team/Stream Areas) from the RTC Web Admin interface ? 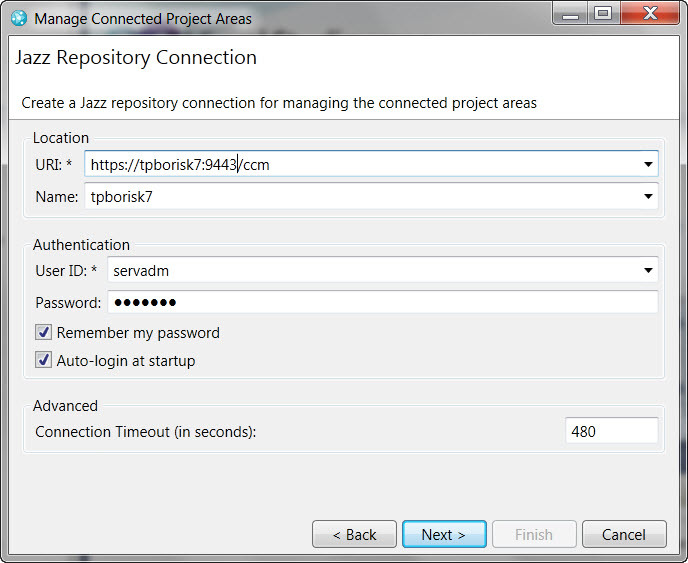 Note: The Eclipse Project Area wizard discribed in the tutorial "http://pic.dhe.ibm.com/infocenter/rtc/v1r0m0/index.jsp?topic=%2Fcom.ibm.team.concert.tutorial.doc%2Ftopics%2Ftut_rtc_scm.html" misses in Visual Studio. In particular, perhaps start at the "Getting started with project areas and lifecycle projects" section. I'll read first the newest tutorial in reference. - create a xml of sample requirment, then send a PUT request to the factory URL, then I can create the new requirment well. if you could help me how to fix the issue, it would be great! I have installed JTS-CCM-RM-repo-4.1Beta1 version on Window 7. It could be a bug.. try posting this question on the jazz.net/forums page. I also am monitoring it and perhaps somebody has had the same issue. You can try the "Extending Team Concert" forum or the RRC one. Everything I saw in your procedure, you are basically working with RTC only, but using Visual Studio as your RTC client. 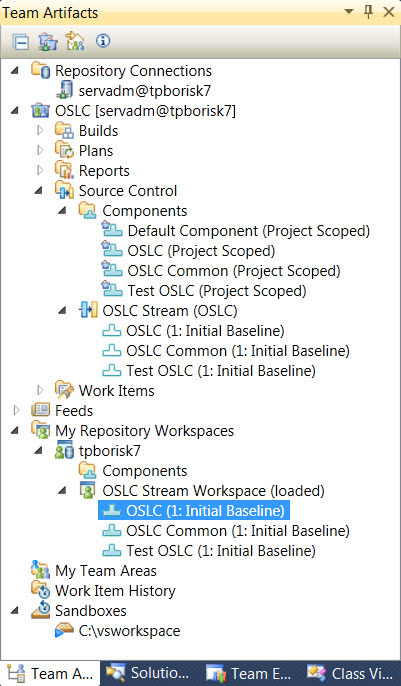 From what I read, I thought with the use of OSLC, you can link the two ALM stystems together. (TFS and RTC). So for example, you should be able to check in files in TFS source control, but use an RTC work item to link to a TFS check in. Or vice versa. Hi, Great.. Tutorial is just awesome..It is really helpful for a newbie like me. I am a regular follower of your blog. Really very informative post you shared here. Kindly keep blogging. If anyone wants to become a .Net developer learn from Dot Net Training in Chennai. or learn thru Dot Net Training in Chennai. Nowadays Dot Net has tons of job opportunities on various vertical industry.